The coloured patches of vorticity forming downstream of the mirror are called vortices, for their rotation. They form a pattern known as the von Kármán vortex street. This pattern is observed in many fluid flows. For example, the famous photo in Fig. 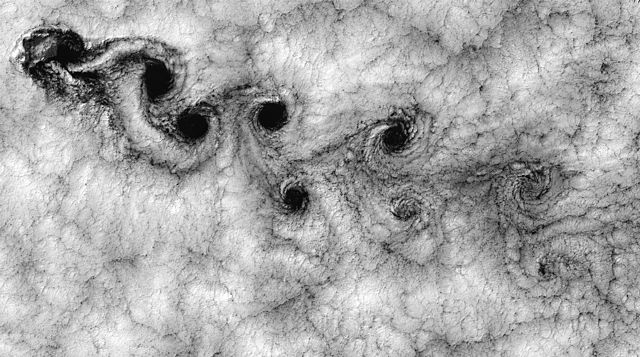 L4 shows the von Kármán vortex street visualized by clouds off the Chilean coast near the Juan Fernandez Islands (also known as the Robinson Crusoe Islands) photographed by the Landsat 7 satellite on September 15, 1999.